Identification: Becker (1983); Whitehead (1985); Page and Burr (1991); Etnier and Starnes (1993). Native Range: Red River drainage (Hudson Bay basin) and Mississippi River basin from central Minnesota south to the Gulf of Mexico, and from southwestern Pennsylvania west to eastern South Dakota, Nebraska, Kansas, Oklahoma, and Texas; Gulf Slope drainages from the Apalachicola River, Florida, to the Colorado River, Texas (Page and Burr 1991). Table 1. States with nonindigenous occurrences, the earliest and latest observations in each state, and the tally and names of HUCs with observations†. Names and dates are hyperlinked to their relevant specimen records. The list of references for all nonindigenous occurrences of Alosa chrysochloris are found here. Means of Introduction: The herring likely gained access to Lake Michigan via the Chicago Shipping Canal (Fago 1993). Unknown in West Virginia. Status: Reported from Wisconsin and West Virginia. Remarks: The report of skipjack herring from Lake Erie was rejected by Trautman (1981). Voucher specimens: Wisconsin (UWM 9962, Wisconsin Department of Natural Resources, Monona, catalogue numbers 18070, 18071). Fago, D. 1993. 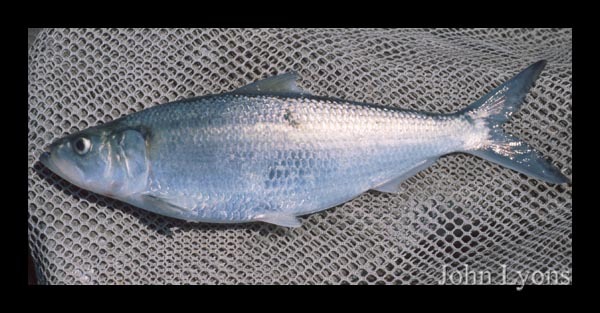 Skipjack herring, Alosa chrysochloris, expanding its range into the Great Lakes. Canadian Field-Naturalist 107:352-353.